I tried out Stitch Fix, a fashion subscription service where clothing hand-picked for you is mailed to your door, in November 2015. 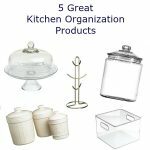 I loved everything, and kept all five items in my box. 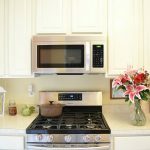 (You get a 25% discount on your picks if you purchase all five items.) Making returns is easy — just return them in the United States Postal Service postage-paid envelope provided by Stitch Fix. This coming spring and summer, there are two important events that I need clothing for. In June, my twin daughters are graduating from middle school. I’d love to have a nice outfit to wear to their graduation ceremony — a big event! My family is also going to Walt Disney World for a week in the summer. I’d love to have some good-looking outfits that will help me to weather the hot Florida sun. So I ordered a Stitch Fix box earlier this month. Each Stitch Fix box contains five clothing items. 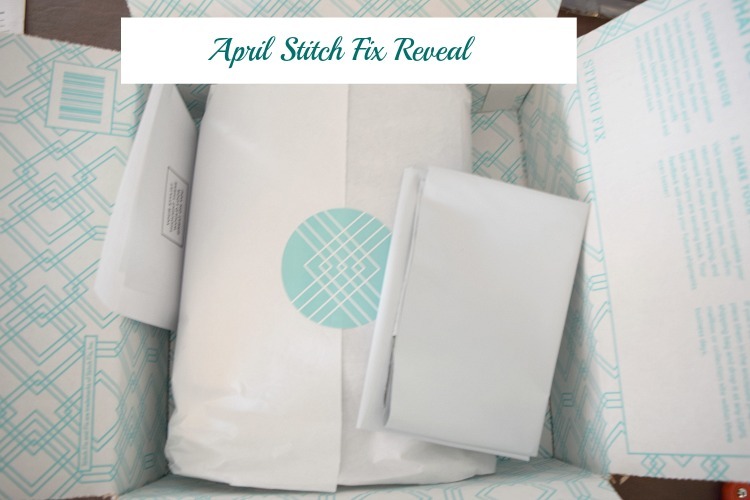 Before you receive your box, you can share with Stitch Fix what kind of items you might be looking for by filling out your Stitch Fix profile and by creating a Stitch Fix board on Pinterest. (I call mine “My Style“). For the service, you pay a $20 styling fee, but if you decide to keep at least one of the items from your box, your styling fee is waived. With my box, I received a detailed note from my stylist describing how she picked the items for my box. 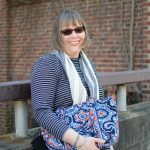 It seems she put a lot of thought into my clothing needs, and the events I’m shopping for — my kids’ upcoming middle school graduation and my family’s summer trip to Walt Disney World. (We haven’t been to Walt Disney World since 2008.) I also received a card about all the items in my box, showing me how I can style each item with separates and accessories. 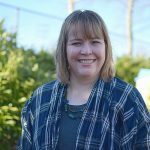 The first item I tried on from my Stitch Fix box was the Francisco Mixed Material Top by Pixley ($54). I liked that the top was a longer-fitting top. I have a problem with my mid-section area, so I like to conceal it as much as possible. I didn’t like that much of the shirt isn’t cotton. I’m hoping to find tops that will look good and be practical for my trip to Disney World. Since it’s likely to be quite hot in Disney for our trip, I’d like to wear mostly cotton shirts to keep cooler. I also felt that the front printed fabric was too thin. Verdict: Return. 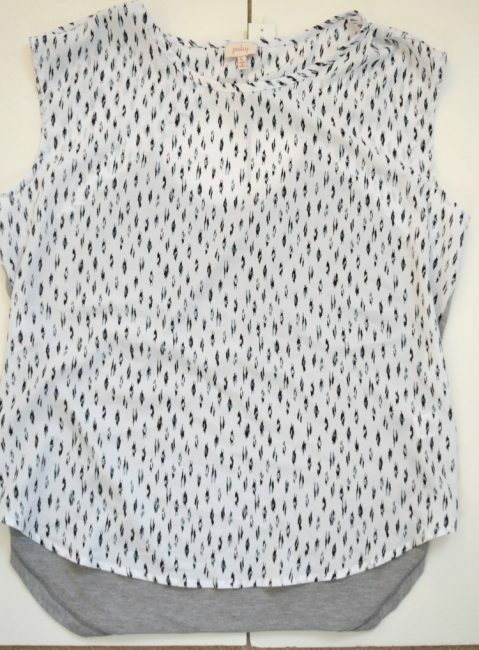 I also received the Atwood Split Back Top ($48) by Market & Spruce in my Stitch Fix box. I wasn’t wild about the combination of the coral fabric over the blue and white print top. I also prefer my shoulders to be covered. I also felt that the blue and white synthetic fabric made the top feel very hot. Verdict: Return. 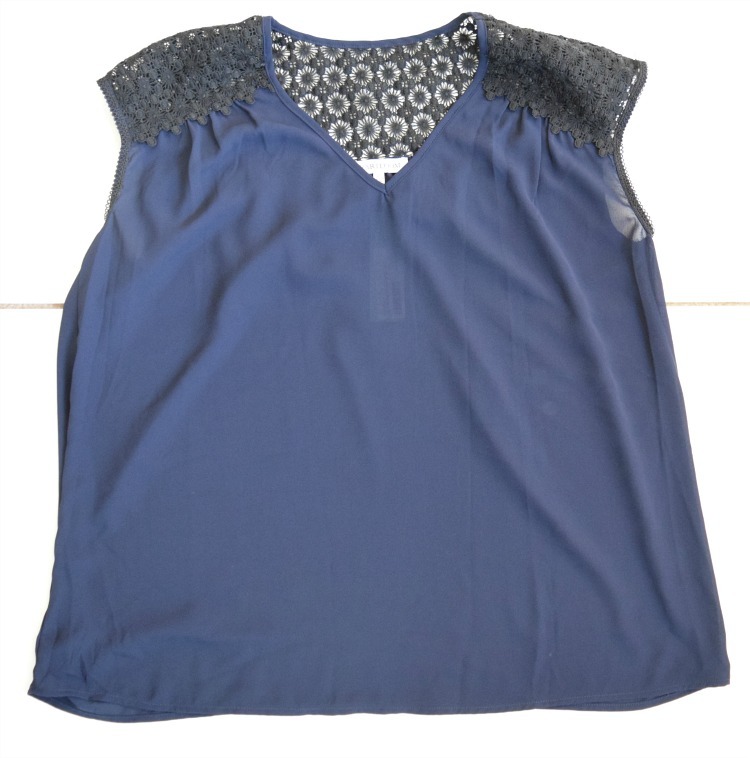 I liked the look of the Jaci Crochet Detail Blouse ($58) by Heartloom when I spotted it in my box. It’s made of a synthetic fabric, however, so I didn’t think it’d be good for my Disney trip. I liked the length of the top, and the crochet sleeves and back, though. When I tried on the top, however, the sleeves felt very tight underneath my arms. Verdict: Return. In my box I also received a dress — the Flynn Colorblock Dress ($68) by 41Hawthorn. 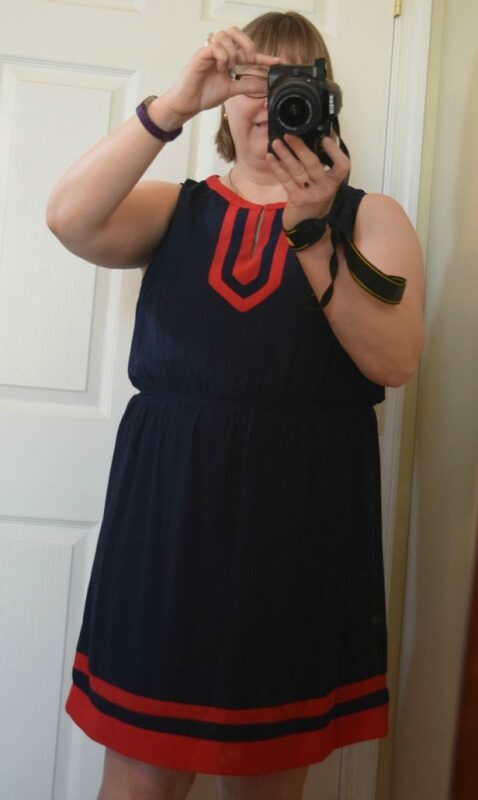 I was excited about the dress because my daughters’ graduation ceremony is coming up in June. I debated whether or not to keep this dress, since it fit me fairly well. But, I felt that the fabric of the dress (which felt a bit heavy and warm) and the dark colors made the dress more of a winter dress. I thought the dress would work with a cardigan. I also tried the dress on with a long gray t-shirt underneath it, and thought it looked OK. But I’m not really in need of a winter dress, and had been hoping for a summer dress. Verdict: Return. 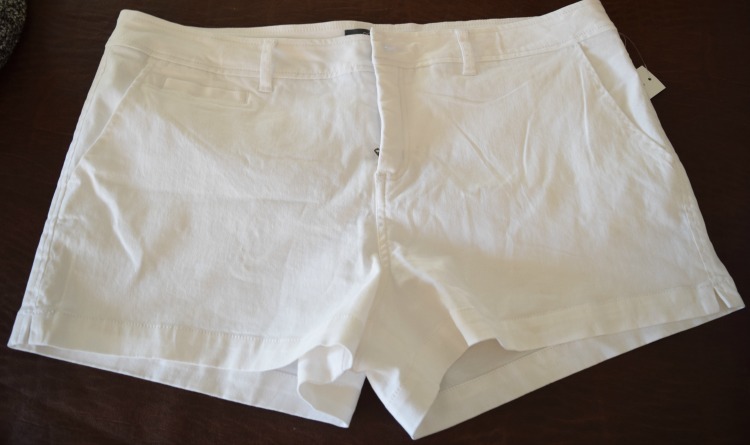 The last item in my box was a pair of white shorts — the Lorraine Short ($48) by Market & Spruce. Upon seeing the shorts in my box, I didn’t feel like they would be right for me. I never wear white shorts or white pants — I am too much of a klutz, and the shorts or pants inevitably become stained! Upon trying on the shorts, I also discovered that they were cut too short for me. Verdict: Return. Although I am returning all of the items in my Stitch Fix box, there is a silver lining! Stitch Fix asks you to fill out a form in your profile detailing what you are keeping and what you are returning from your box. When I filled out my form, I included in depth details about why the clothing I received wasn’t a good fit for me. A day or two later, I received an email from Stitch Fix, apologizing that my Stitch Fix box was not right for me. 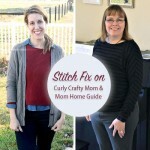 They asked me for more details about my personal style, and shortly, I was matched up with a stylist who will be styling my next Stitch Fix box. I was also told that the styling fee ($20) on my next Stitch Fix box will be waived. I am looking forward to receiving my next Stitch Box in early May! (That’s good customer service.) I am hoping to find items for my Disney trip and my daughters’ graduation ceremony in my next Stitch Fix box. 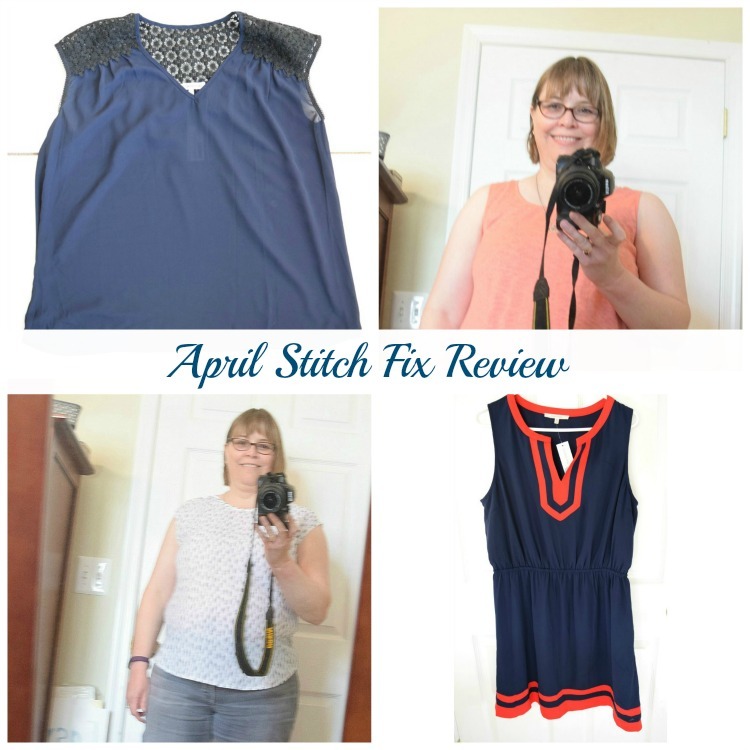 If you want to try out Stitch Fix, here’s a link. 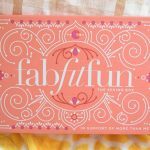 I get $25 referral credit toward my next box, and you get the regular Stitch Fix price on your box. 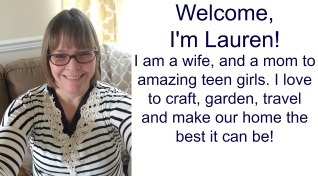 If you sign up, you will also get a referral link and could get Stitch Fix credits, too! That’s a great way to build your wardrobe! Another plus — Stitch Fix is now styling guys, as well, so you can get a Stitch Fix box for your man, as well! I actually really love that color top with the blue/white patterned layer on you! I think it is my fave! I think it could be a little longer tho for a better fit. That dress would be perfect for a fall or winter event! It is so nice of them to let you try another box on them!